Ever since Lord Brougham was turned away at the France/Italy border-crossing in 1834 (due to an unfortunate case of “foot & mouth disease”) and by lucky chance discovered the charm of the bay of Cannes with its unique microclimate – the French Riviera, or “the Côte”, has been a legendary destination. Not only the azure blue color of the sea but, as many artist-residents explained, “it’s the light” which inspired the brilliantly coloured paintings by Matisse (in Nice), Renoir (in Cagnes), Picasso (in Vallauris), and particularly Chagall at St Paul de Vence, the old town which in itself may be the most interesting objective for any traveller, both for its physical presence and its various memories and meanings. 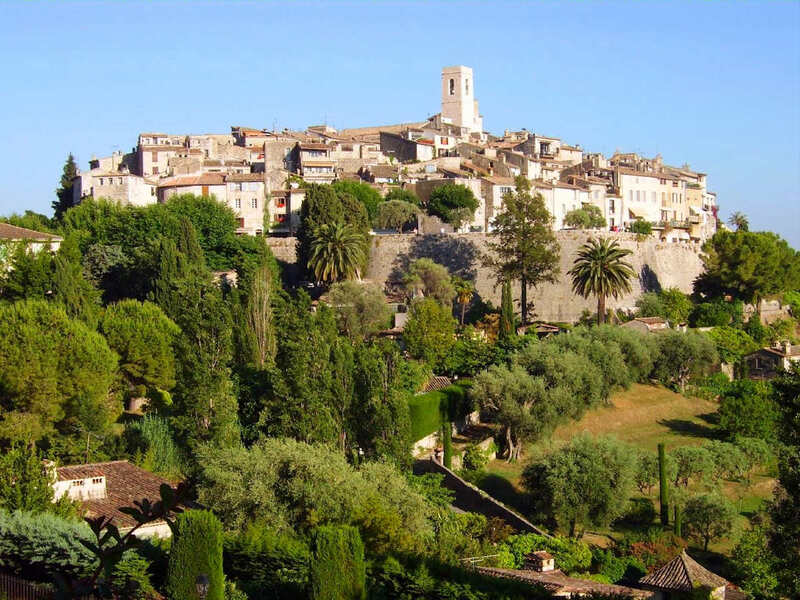 It is worth leaving the cities and dramatic coastline of the Riviera to drive into the valley of St Paul de Vence. This once frontier-town, situated between France and the former state of Savoy, sits comfortably around the upper contours of the hill slope, rising to a high point at the ancient chapel tower and still surrounded by the ramparts of the defensive wall.For many moments of the day, it looks from a distance like a floating mirage, a ghost from the past. In fact, although lovingly preserved and only accessible on foot, the town could not be more alive and is much used both by permanent residents and transient visitors. Before reaching the approach to the main gateway, the huge letter “M” of welded steel beams by Alexander Calder points away from the town towards the celebrated Maeght Foundation, one of the most valuable contemporary collections of European 20th Century art. Founded by Aimé Maeght in 1964, it contains, amongst many others, works by Chagall and a whole courtyard of 60 Giacometti bronze sculptures, including two of his famed “Walking Men”.Asked to describe Giacometti, Chagall once explained “he feels profound forces of nature. 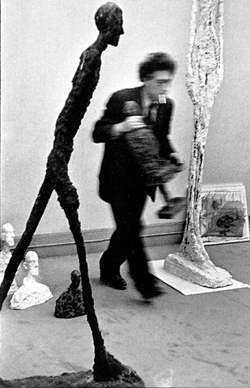 !”In 2010, a Giacometti “Walking Man” ,“l’homme qui marche”, was sold by Sotheby’s in London for a then record breaking £62M – cheered on by the late Aimé’s granddaughter Yoyo who later said that her feeling at the time was “Bravo Papi!…. and after that, of course, I was furious because I thought of the insurance!” (Referring to how much she’d have to insure the two remaining ones in the courtyard, never mind the rest of the sculptures there!). If instead of taking the turn towards Maeght, one continues towards the historic town, the outstanding landmarks on its approach are the Colombe d’Or and the Café de la Place – each an unforgettable destination in itself. The Colombe d’Or, a comfortable but rustic hotel/restaurant, came into its own when the Côte became the center of bohemian artistic France.Matisse, Chagall and Picasso were regulars at the inn and the Roux family owners built up a now fabled personal collection by accepting paintings and sculptures, from the then unknown artists, in lieu of payment for hospitality. The collection is still displayed in the dining room walls. There, it is rumored, Chagall exchanged words with Picasso. The latter had suggested “when Matisse dies, Chagall will be the only painter left who understands what color really is” – to which Chagall countered saying “what a genius that Picasso, it is a pity he doesn’t paint”. Amongst the many famous guests were Chaplin, Marlene Dietrich, Edith Piaf, Greta Garbo, Jean Paul Sartres and Simone de Beauvoir, Sophia Loren, Catherine Deneuve, Peter Ustinov, and many more.The actor Yves Montand and later Bill Wyman of the Rolling Stones liked the unique ambience so much that they even had their wedding receptions there. Looking at the town from the valley below, is the 17th century farmhouse of Bill Wyman, whilst Roger Moore, after his James Bond appearance at the Cannes Film Festival, purchased a home nearby and was a regular at the Colombe d’Or with his actor friend and restaurateur Michael Caine, until forced to relocate to Monte Carlo when his 3rd marriage broke down. On many occasions the Café de la Place across the road from the Colombe d’Or saw a cheerful crowd on the terrace cheering Yves Montand on to victory, in the boules/pétanques game played on the Grande Place in front of it – and roaring with laughter when the losers had to kiss a ceramic lady’s bottom, known as “Fanny”, hidden behind red velvet curtains near the bar. It is this atmosphere that attracts visitors to St Paul from around the world, making it possibly the single most visited town along the whole French Riviera with something to offer to everyone in its antique shows, art galleries, original souvenirs,panoramic views and a living record of the past.